In October 2015 Cocoa Brown launched two new products to add to their already extensive tanning range, the Instant Bronzing Gels available in matte and shimmer and I was kindly asked if I would like to try one of the Bronzing Gels, I chose the matte Bronzing Gel. The bronzing gel is packaged in the usual pink Cocoa Brown packaging and has a flip top lid, the lid screws off for the first application and there is a silver paper tab covering the opening of the tube, once this is removed the gel can be squeezed out of the tube with ease, the tube contains 150ml of product. Instant / Wash off : Great for last minute tanning for special occasions. Rinses off in the shower. No fake tan pong : Beautifully scented with Cocoa Brown Tahitian Gardenia signature scent. Two variants : Available in ‘Shimmer’ with light reflecting minerals & ‘Matte’ for that signature bronzed, Cocoa Brown glow. Lightweight gel formula : Easy, non-sticky application & results will last longer than bronzing powder. Dries instantly : Apply and get dressed within minutes before heading out! Facial tanning : Can be layered over your makeup to contour/highlight or used as a foundation replacement for an easy, everyday glow. The first thing I noticed about the bronzing gel is the scent, it doesn't have the usual "biscuit" scent that most fake tans have but it does have a very strong scent to it and is the "tahitian gardenia" signature scent of Cocoa Brown. The scent is very strong and whilst I don't mind the scent some may find it a little overpowering. I applied a small amount of the bronzing gel to my arm and then used a towelling tanning mitt which is my preferred method of applying fake tan and buffed the gel into my arm, the gel was extremely easy to apply and buffed in effortlessly. I didn't have any streaks at all and it took me seconds to buff the gel into the lower half of my arm, the gel dried in seconds and I was left with a lovely golden streak free tan which looked incredibly natural, on first impressions I was extremely impressed. 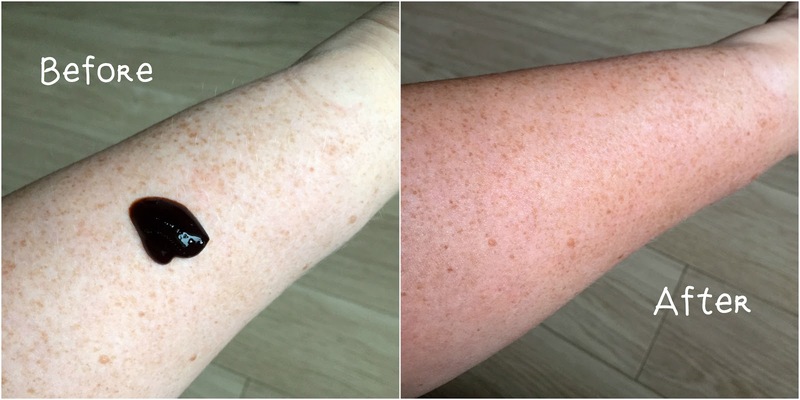 The above photograph shows my arm before and after I used the bronzing gel for the first time, the amount of gel on my arm in the photograph on the left is the amount I used to tan the whole of my lower arm. As you can see from the photograph the tan is a lovely golden shade and looks very natural and is streak free, I am a complete novice when it comes to applying fake tan and if I do ever wear fake tan my daughter Lissy applies my tan for me because I am unable to do so due to medical reasons, I found the bronzing gel extremely easy to buff in and I didn't have to try to get a nice even finish it applied beautifully and streak free too so if you're a first time tanner don't be put off because it is super easy to use and if I can apply it anyone can. I have since worn the bronzing gel on my arms, legs, chest and face basically the visible areas of my body. Lissy applied the gel for me using a towelling tanning mitt, it applied effortlessly and very quickly and dried quickly too, the gel buffs in effortlessly and doesn't leave any streaks at all. The gel didn't transfer to my clothing and was very easy to remove in the shower using regular shower gel and a shower pouffe (or whatever those things are called) I like that the gel is non-comodegenic meaning it can be used on the face without causing breakouts, the gel can be buffed directly onto the face using a mitt or a make up brush which is my preferred method or you could mix the gel with some of your favourite foundation too to give a bronzed look. I was really impressed with the Cocoa Brown Instant Tan Bronzing Gel in matte and agree completely with the claims of Cocoa Brown, the tan isn't sticky at all and is nice and lightweight, I found the gel super easy to use and I like that it dried really quickly meaning I didn't have to wait to get dressed. The tan is extremely easy to remove and didn't have to be scrubbed off and didn't leave any remnants anywhere which some tans do. I would recommend the bronzing gel and especially to those who maybe new to tanning or struggle to achieve a streak free tan. I think this would be ideal for someone who wants super speedy tanning results or if you have an unexpected outing that you want to be tanned for say an impromptu night out, the only negative I could find is the scent although one I find quite nice, is very strong and whilst that doesn't bother me at all it may bother some people and is worth mentioning. If you would like to try the Cocoa Brown Instant Tan Bronzing Gel in matte you can find it HERE for £5.99 or if you would prefer to try the shimmer version of the bronzing gel, you can find that HERE for £5.99. Have you tried either of the bronzing gels? Which is your favourite?